I drove home from Rochester and left for Quilt Week in Des Moines with only 34 hours at home to unpack, do laundry, get a flu shot, repack, and catch a flight. When I have to wake up at 3am, it is sometimes easier to just stay awake. I chose that last night. I dozed a few minutes on my flights, but have basically been awake for 38 hours right now. Once I found the quilt show, I spent today setting up my classroom and preparing to have a fun week with my students. I am so sad to see my classes at Discount Sewing Center end. I really enjoyed all of the students there! Does anyone know what it is? BECAUSE IT IS NOT CAKE! ... there's still more Halloween fabric left! What should I make next? I'm running out of ideas/patterns. Help! What a fun day I had at Discount Sewing Center in Rochester, NY! Her sign says "It's all fun & games until the bobbin runs out!" He bought me cake. He loves me! I'm kind of sweet on him, too. Even if I don't get any sewing done today, it was a truly great day! After trying three different cords, I realized that the USB port in my car was dodgy. I pulled out my spare battery for my phone. Sadly, I used it earlier this week and never re-charged it. I KNOW BETTER THAN THAT! I pulled out my laptop and tried to charge my phone from my laptop battery, but it didn't work. When I stopped for lunch and tried to find a solution, I realized that in addition to the USB port in my car being shady, the cord I chose to use to charge from my laptop batter was iffy at best. I pulled out another (working!) cord and depleted my laptop battery during the remainder of my drive. Do you know how shaky I was without a fully charged cell phone during a 7-hour drive? I normally listen to books from my phone, or talk on the phone, or (voice-activated) text from my phone while driving. It was the longest. drive. EVER! Now that I am in my hotel room, my spare battery is charged up, my laptop battery is charged up, and my phone battery is at 100%. I HAVE LEARNED MY LESSON! Notice the shoe next to the foot pedal? I told you I made myself at home! I had a huge collection of Halloween fabrics and I'm trying to use it all up. I've made several quilts from this stash in recent weeks and now I'm working on another. What shall I do with the fabric that is left? I'm running out of ideas! "I will not cut my charging cord." "I WILL NOT CUT MY CHARGING CORD!" I wrote out the accompanying tutorial here. Last weekend I was at the Grand (re)Opening of the Quilt Basket in Pawling, NY. It is my local quilt shop. I have shopped there for 21 (?) years and am thrilled to continue shopping there for years to come! The shop owner's nephew is quite the artist! The quilt pattern is Squared Away. I will share more exciting news about this pattern line in the near future. Guess who is going to Quilt Market? If you read my blog, you might know that I LOVE MY JOB! I love Handi Quilter, I love teaching quilting, I love quilters... I just love everything about it! My job involves a lot of travel, and I try to use my travels as an opportunity to reconnect with family and friends in different parts of the world. I think the pattern was from Open a Can of Worms? I made the blocks YEARS ago, and finally pieced it together. I shipped this quilt out a week or so ago, but delayed posting in case she saw this post before the mail arrived. Dear cousin, I hope you love your quilt! My house is on a diet. I try to take stuff out of the house with me every time I leave. I had two bags to drop off at my local quilt shop. Two small items to bring to my good friend John Kubiniec. A thermos for a friend's daughter's lunch. 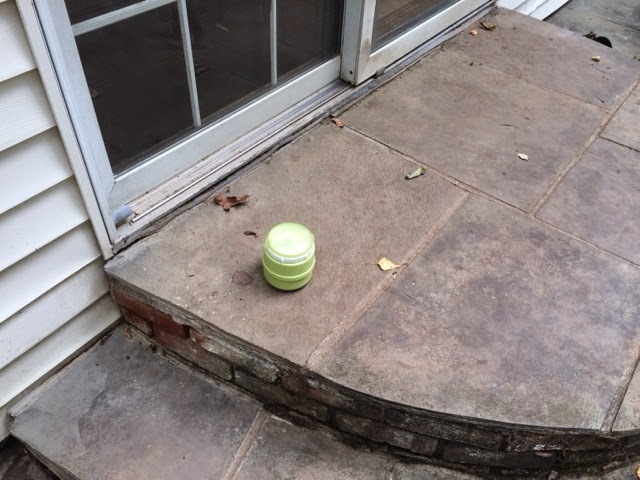 She wasn't home so I left it on her porch. 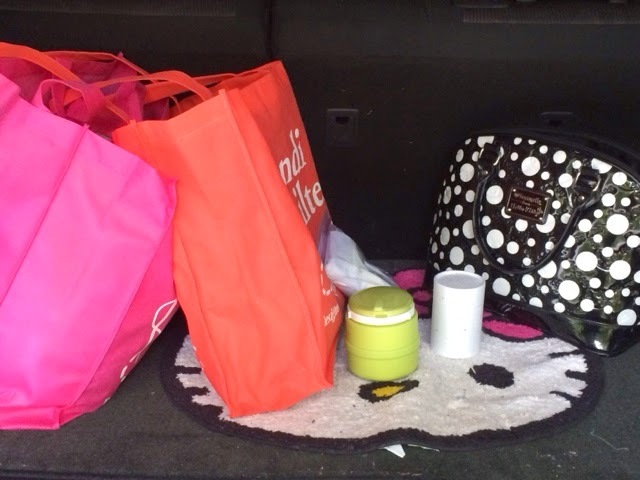 The Hello Kitty rug and Hello Kitty purse stayed with me. 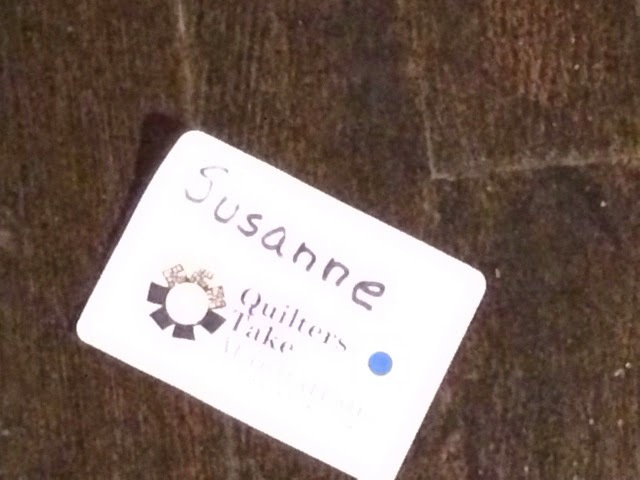 I spent Saturday night at Quilters Take Manhattan After Dark cocktail party. And what a party it was! I got to chat with enthusiastic quilters and industry professionals. The time passed so quickly and I had a wonderful time! My brain is full of new quilting ideas and my heart is full with new quilting friends. I met a quilter named Suzanne. One glass of wine and this Syzanne was on the floor. We had a good laugh about finding her name tag on the floor and I promised to write a scandalous story about her on my blog. Hi Suzanne! I can't wait to see you in Houston! I'm going to be a California Girl! Did you know that I am teaching at Road to California in January? I LOVE THAT SHOW! The fact that the weather in California in January is slightly better than New York doesn't play into that opinion at all. I will be teaching six full days of classes there. WooHoo! I will spend three days loving on the Handi Quilter Sweet Sixteen and three days loving on the Handi Quilter Avante. Who could ask for anything more? My classes are filling up, so now would be a great time to sign up if you want some sunny California quilt classes in January. This weekend I will be attending the Grand (re)Opening of The Quilt Basket. They moved from Wappingers Falls, NY to Pawling, NY. There are special happenings at the shop on Saturday and Sunday. I even heard that there will be ice cream! Mmmmmmmmm.........ice cream. 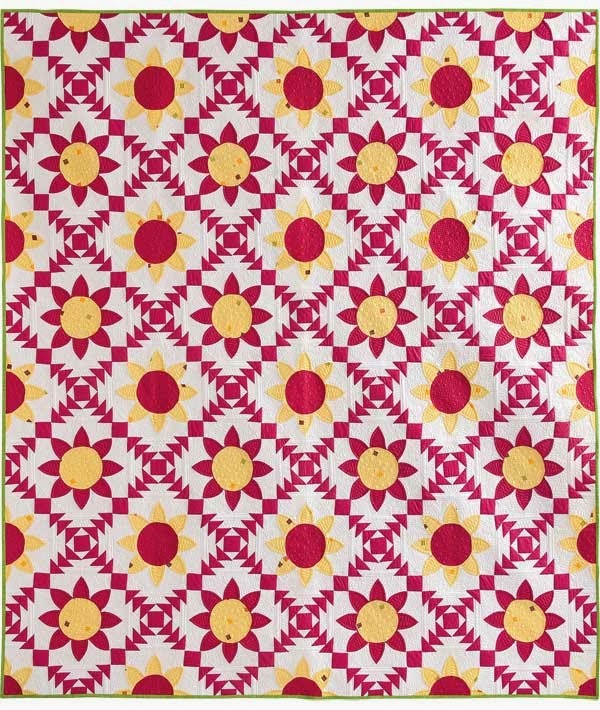 It is the sample for my new pattern, Squared Away, available from the Quilt Basket. I'm so excited about this line of patterns because they use fat eighths of fabric and backgrounds, borders, etc. There is very little waste so these quilts are economical to make. New quilters with a small budget will benefit from this, as well as quilters like myself who don't need any more fabric but just want to play with pretty! new! fabrics! and don't want to spend a lot of money on their whim. Read more about the patterns on their blog here. I first went into The Quilt Basket in 1993. Cathy was able to answer my questions, guide me in fabric selection, teach classes, and basically act as my quilting mentor. I am so excited to still have a great quilt shop in my area. I know the quilty goods are available online, but nothing can replace a local quilt shop. Will I see you in Pawling this weekend? Did you know that all of my teaching engagements are listed on my website? I do this so that my husband knows where in the world I am on any particular day, just in case he forgets! Will I see you at an upcoming event? Will there be cake? Last night I attended my quilt guild meeting. Our guild has an active community quilts program. I try and quilt up a few quilts a year for them, as my time allows. This week, I quilted one of their tops and bound it with a little last-minute help at my table. Thanks Louise and Trish! We imitated a sewing bee at the quilt guild to get this puppy done before the meeting ended. Our fingers were FLYING! The morning sun made this a difficult photo, but soon the sun will be gone for the winter and I'm not going to complain about it! I made this quilt from scraps and my Marti Michell Log Cabin Ruler. I quilted it using a Baptist Fan pattern. All of the fabric was from stash and the batting was from stash as well. My studio doesn't look emptier now that I've finished the quilt, but technically, there has to be less stuff in here (unless my fabric multiplies when the lights are out). I hope that whoever receives this quilt loves it a lot! I donated all of my old eyeglasses to my eye doctor to donate to folks who need them. There is now one less box in my house to trip over, and hopefully these glasses will help others who can't afford them. And now I am out of scraps! I hope she liked them. Now I have to get busy making more scraps! I am excited to announce that one of my patterns has been published. I took this photo just to torture myself. I can not show the quilt to anyone nor can I post the photo online, so it just sat on my phone and BURNED. I feel so much better now that I got to tell you my news! The quilt was made with American Made Brand fabrics. There are 50 colors in the line, but I only managed to use 18 in my quilt. I'll have to design something else to use the other 32 colors! The Quilt Basket is selling these patterns at a super-reasonable price (I think under $5). This way, you can collect all of them! So long, Bits 'N Pieces. I look forward to coming back to teach at your shop again in November! The Northeast US is congested and I have to drive through several major traffic areas on my way home. To take advantage of relatively kind Sunday evening traffic, instead of awful Monday morning rush hour traffic, I drove past Boston after class and checked into a hotel a little closer to home. I will stll have to wait out the morning rush before resuming the drive home, but at least I'm past the worst of the traffic. I don't need much more than that in a hotel room. I planned to bind while watching Netflix, but I will confess that I fell asleep as soon as I sat down. I guess I should just be thrilled with the outlet for charging the iPhone, since I didn't get to bind the quilts or watch Netflix tonight. I spent another fun day at Bits 'N Pieces in Pelham, NH. We worked through the Fun of Finishing and Feathered our hearts out. These quilters were master featherers and my brilliant bag was in high use today! I am now thinking about the quilting (of course!) and am torn. Should I use a fun computerized Halloween pattern? Or free-motion quilting including some spiderwebs. I spent a wonderful day at Bits 'N Pieces in Pelham, NH. Today was all about the Pro-Stitcher. Computerized quilting is so much fun! Yes, I think she knows me pretty well! Liz knows me pretty well, too! After work, back in my hotel, I talked to Kay at the front desk. She is a competent young woman and I kept her company while a ghost kept calling the front desk. Room 129 kept calling and calling and calling; room 129 was vacant! Oooooooooo... spooky! I cut out all of the pieces and then sewed a few blocks just to see how they would look. I used a cream background and the Halloween prints have white in them. My nonsensical "don't mix white and cream" buzzer was in overdrive about this last night, but I think it looks pretty OK. Tomorrow night I hope to power-sew through the rest of the blocks. A good day in New Hampshire, indeed. Sending might be too strong of a word. "Dropping Off Stuff" might be more fitting. This scarf belongs to my son. He moved out three years ago. I drove by his house yesterday and there is now one less item in my house. Hurray! I am in New Hampshire, tucked into my hotel and ready to teach at Bits 'n Pieces in Pelham tomorrow. I love that little shop! The students there are like family. I wound bobbin after bobbin, preparing for my hotel room sewing. Did you know that I am teaching at AQS Quilt Week in Des Moines, Iowa? Handi Quilter was generous enough to sponsor a room full of HQ18 Avante machines for the students' quilting pleasure. 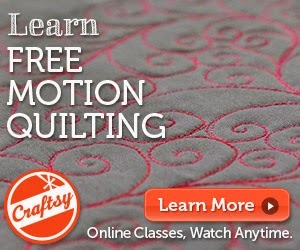 If you want some hands-on longarm quilting education, this is a great opportunity! I know that quilt shows are a great way to spend vacation time and to keep the "no work" feel going, I am hard at work in my studio packaging the class kits so that you won't need to bring any supplies with you. I hope to see you in Des Moines in October! 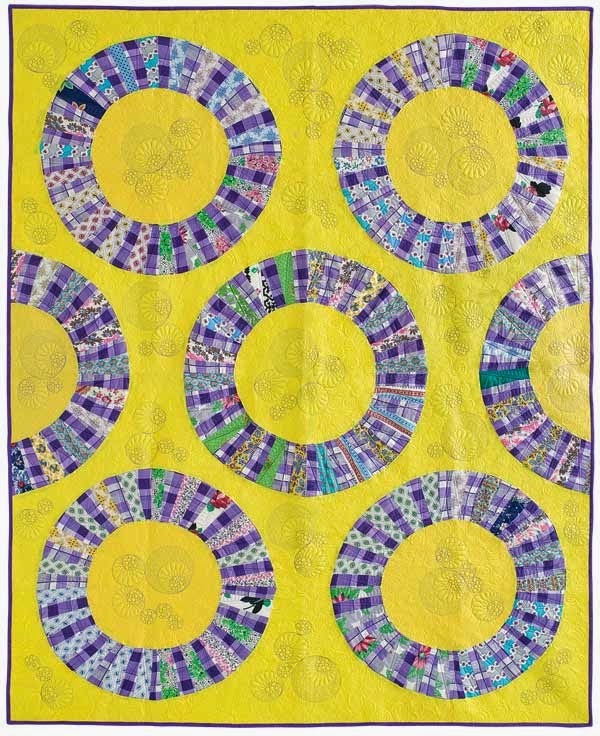 If you want to see these quilts in person and are in the Atlanta area, visit Quilting Live! My quilts and all of the others are hanging in the show. If you do go to the show, please take photos and post them for me? I will be in New Hampshire this week, which is really far away from Atlanta, and can't get to the show. PS -- the magazine is available at newsstands now. It's time to start sending out stuff! I mailed these treasures to my mom. 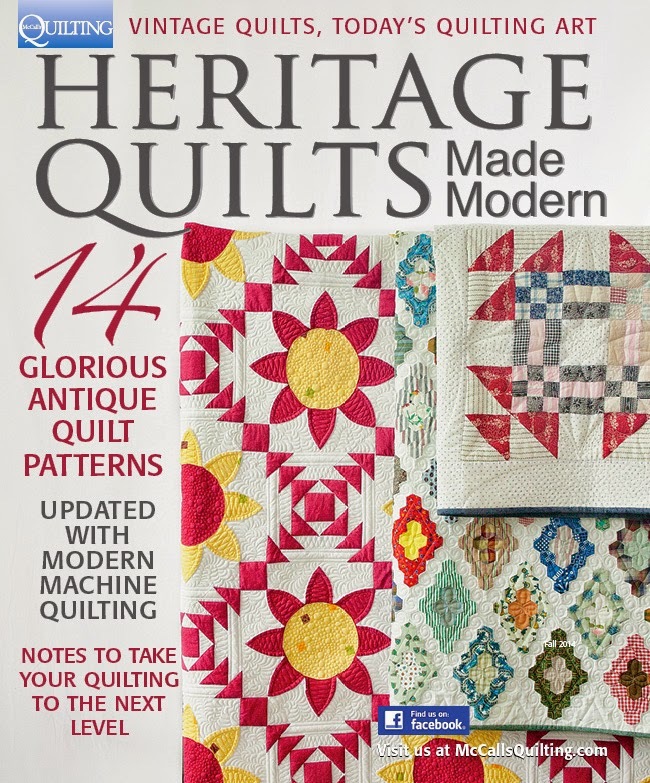 The magazine has two of my quilts in it, one being on the cover! I have several copies of this magazine and decided to give one away. Mom had to search through the magazine to see why I sent it. She asked if the photos of the quilts were taken in my living room; they were taken in the lovely Artwork Network Gallery in Denver, Colorado. My living room only wishes it could be so beautiful! The two placemats were pieced quite some time ago in the style of Victoria Findlay Wolfe's 15 Minutes of Play. I recently quilted them and just finished the hand binding while on my last extended trip. Mom gushed, "They are so beautiful! They are bigger than the last ones that you sent me. I don't know if I can use them!" Um, Mom? Scrap pieced placemats with black fabric can handle spaghetti dinners and a washer/dryer. The knitted dishcloths were also finished while in my hotel rooms. I started knitting dishcloths for Mom to use when I was a little girl and I also used to sell them at a little craft shop for $2. Mom always wants more dishcloths and she says that the lady who runs the shop still asks if I'll knit some for her, too. Every once in a while, I grab the old needles and some cotton from my yarn stash and make a stack of them for mom and the craft shop lady to fight over. Mom always seems confused when I refuse the $2. I can't tell you how much this makes me smile. My house doesn't look much emptier with these items gone, but I enjoyed mailing them out. I'm now plotting my next "sending out stuff" mission.